A short quiz (5-10 questions)in the classroom can be an effective and efficient way of giving students feedback on their progress. It can be good formative assessment. However, doing this on paper can be time consuming. There are a number of software packages that can be used for this purpose – but they come at a price. There are also a number of websites which have ready made quizzes but these need a connection to the Internet (e.g. Learning Circuits). There are other activities which present an explanation followed by a quiz (e.g. Brainpop). 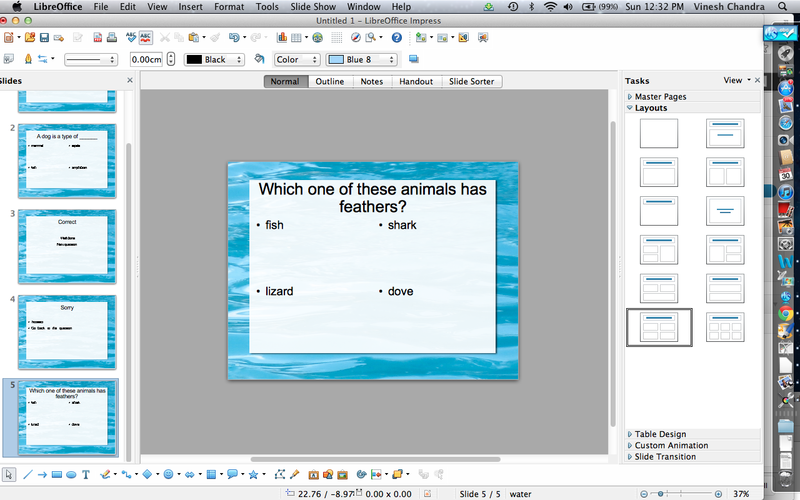 Presentation in Libre Office can be used to create quizzes. 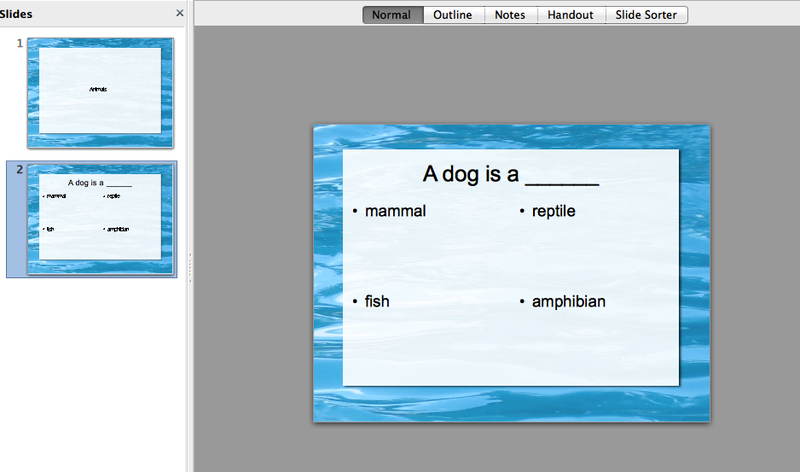 Microsoft PowerPoint can also be used for this purpose. While making a good quiz can take time, once created it can be used over and over. It can also be shared with other teachers. Therefore the work load and the time required is shared. The following steps outline the process. 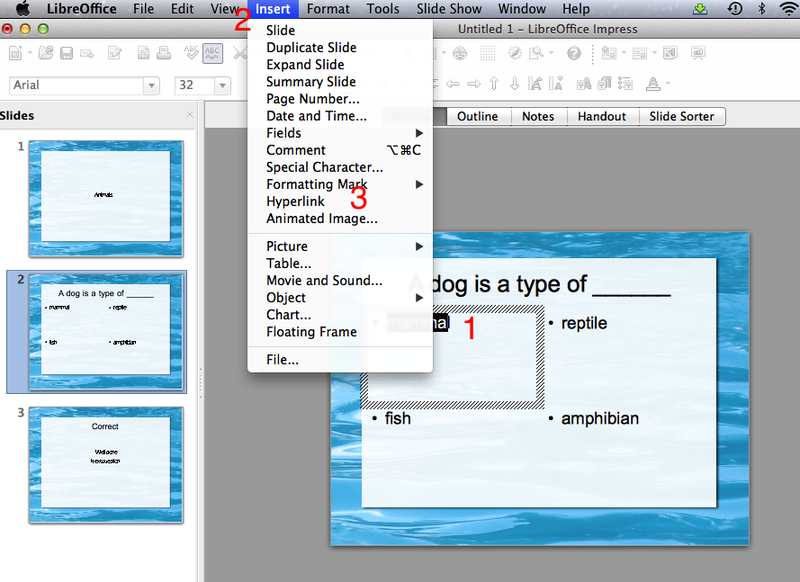 You can make the activity as interesting as you want by embedding audio and video in your slides. Click on Templates. 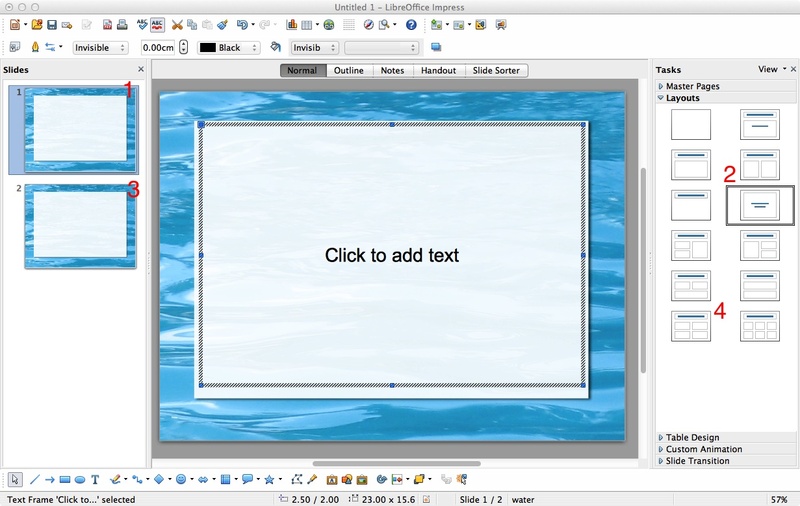 For this activity, the “Water” template was selected. For the first slide(1), the layout chosen is like the title page(2). By choosing INSERT followed by SLIDE, the next slide was inserted. 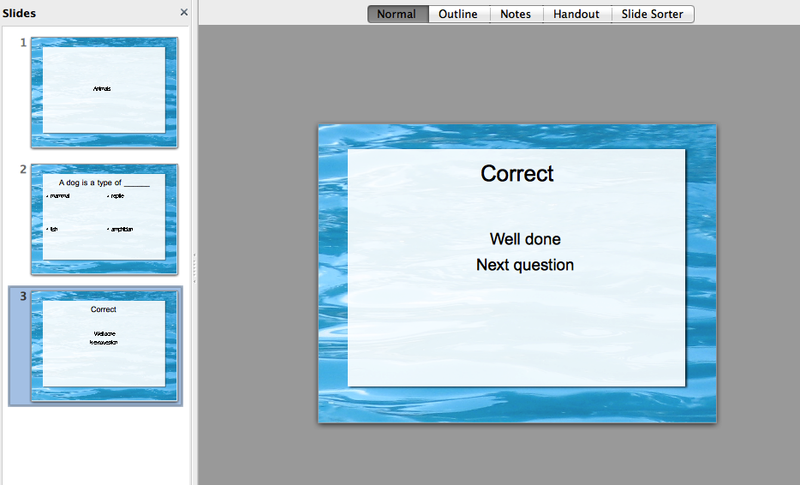 For this next slide(3), the layout chosen(4) allows four options to be written for a quiz. But this can be changed to suit the type of quiz that is being created. The first question has four options as shown below. Now, the correct answer Mammals needs to be linked to the Slide which tells users that they have entered the correct answer. To link the slide, click on highlight the answer(1), then click on Insert(2). From this option, choose Hyperlink(3). On the hyperlink window, click on “Target in document”(1) option. From here select Slide 3(2) because this is the slide with the correct answer. Click on Apply(3) and close this window. From the menu options at the top of the page, choose Slide Show to check if by clicking on the Mammals – the correct slide follows. Now another slide needs to be created. Each time the incorrect option is clicked, a slide should indicate this and take the student back to question for another attempt. The steps that were followed with the correct answer i.e Steps 5 and 6 need to be followed here as well. 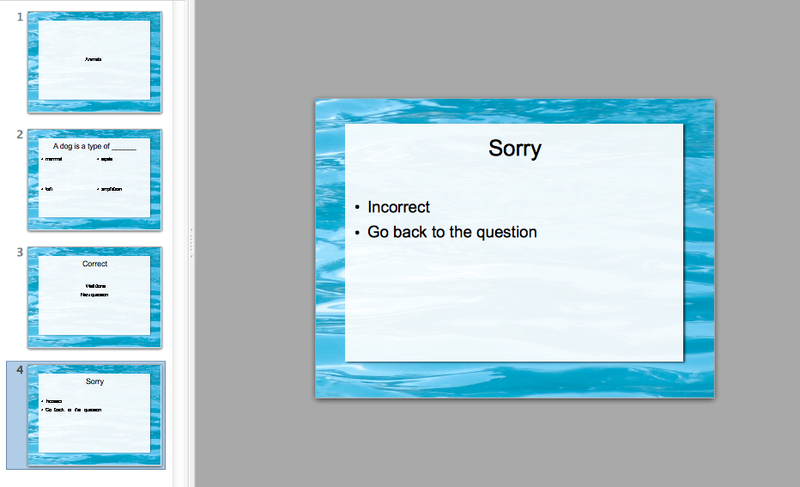 Each time any of the incorrect responses are clicked, the Sorry slide(above) or Slide 4 should appear. So the steps are – Select an incorrect response(1), click Insert(2) in the menu bar, from here choose Hyperlink(3), followed by Target in document(4) and then Slide(4). So for each question, there has to be a slide for the correct response and a slide for the incorrect responses. Now the next question slide can be created. 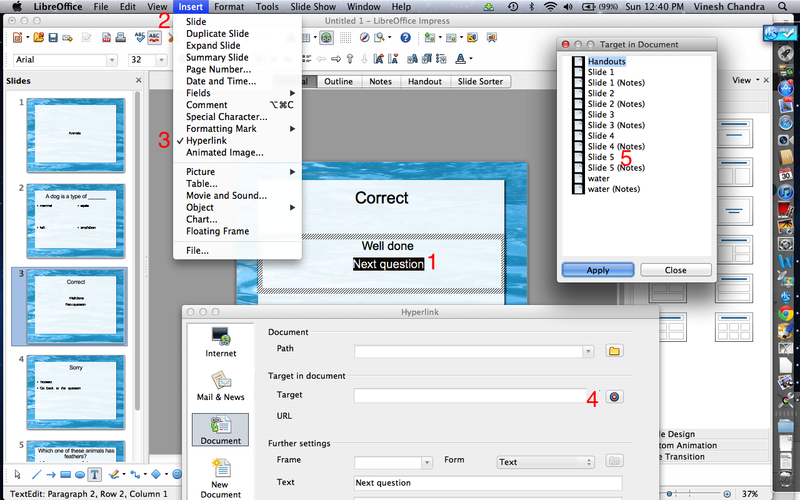 To direct the student to this slide, the go to the Next Question option (see Step 4 above) needs to be hyperlinked to it – in the same way we have linked other slides. The first step is select Next Question(1), then Insert(2). 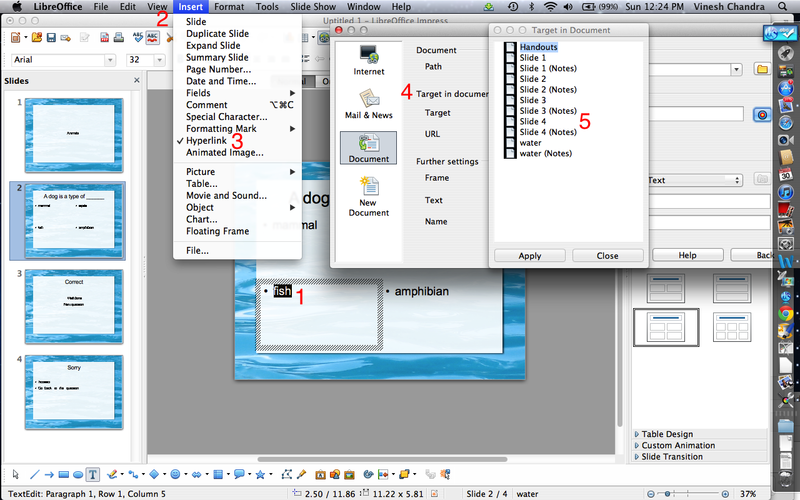 From here choose hyperlink(3), then Target(4). The target chosen is Slide 5 (5) because this is the slide for the next question. 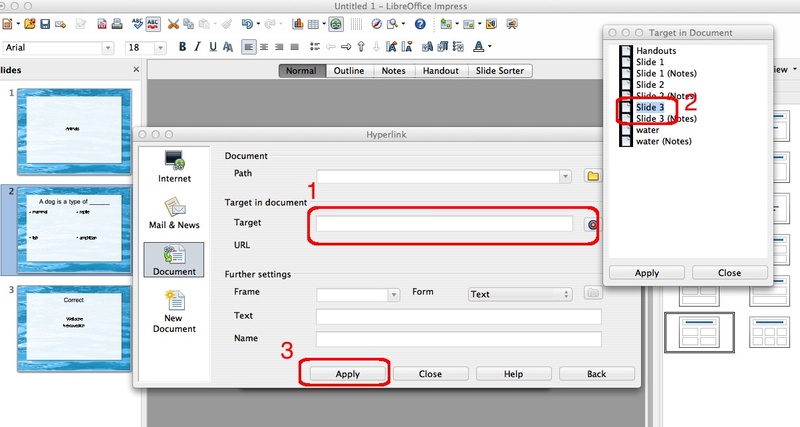 Once done, choose apply and close on the Target in Document and Hyperlink documents. This cycle is repeated with the questions that follow.